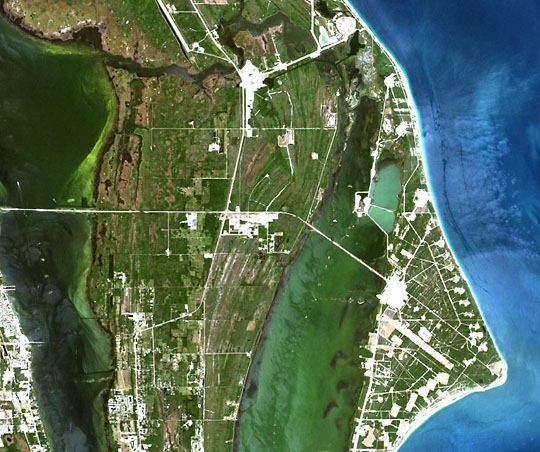 Description: This is a satellite image of Kennedy Space Center on June 3, 1999. NASA's Kennedy Space Center, located on Merritt Island just off the east coast of Florida, is the site of all Space Shuttle launches. This true color Landsat-7 scene shows the center, one shuttle launch pad (39A, top center in the image), and Cape Canaveral Air Force Station. Most of the areas surrounding the facilities are coastal wetlands. These havens support 15 wildlife species federally listed as endangered or threatened, including sea turtles, West Indian manatees, southern bald eagles, wood storks, peregrine falcons, eastern indigo snakes, and Florida scrub jays. Map Credit: Courtesy of the EROS Data Center.